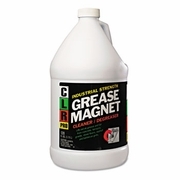 Non-toxic, non-corrosive industrial strength degreaser lifts out oil, grease and tar making it suitable for factories, garage floors, machinery, motors, printing presses and more. Also can be used for pressure washing and parts cleaning. Water based and biodegradable. Non corrosive formulation contains no acids, abrasive or petroleum solvents. Will not harm grass, shrubs or surrounding vegetation.